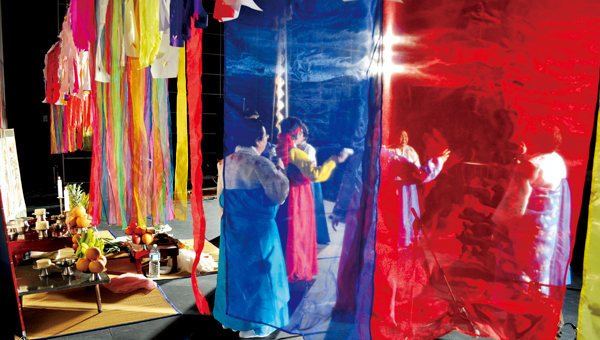 A special performance of Jeju Chilmeoridang Yeongdeunggut was held on Dec. 7 at Jeju Movie Center in Jeju City, to celebrate the first anniversary of the cultural rite’s nomination for UNESCO World Intangible Culture Heritage. Its dances and songs place it in the performing arts category, while the garments and instruments required for the shaman rituals rank among traditional craftsmanship. Jeju Chilmeoridang Yeongdeunggut is an annual Jeju ritual. It is performed in the second month of the lunar calendar — called Yeongdeung — to honor the goddess of wind (Grandmother Yeongdeung) and to pray for an abundant harvest and sea catch. On the first day of the Yeongdeung month, Grandmother Yeongdeung arrives with her family (the winds) to enjoy the island’s beauty. Spring arrives when she leaves. However while venerated, Yeongdeung also instills fear as she stirs up the sea. From early to mid-February, when the goddess is present on the island, the sea is particularly turbulent. The islanders believe that when she leaves she removes all the contents of the shellfish. On the day of departure, however, the goddess also sows seaweed seeds along the shore to ensure people’s livelihood and purifies the sea to help the growth of the seeds. As such, importance has been attached to the time of her stay and people began to mark the occasion by performing a rite at the Chilmeoridang Shrine in supplication for safety and good sea harvests. Main Photo: Chogamje. The welcoming rite begins with a “call to the gods” ceremony, which involves greeting and inviting the gods to the shrine as well as reciting the participants’ names. Bonhyangdeum is a ceremony held upon the entering of the village shrine. The god and goddess are asked by the shamans to ensure the well-being of the village. The ritual includes three village officials offering drinks to the gods. Ssidrim (an offering of seeds) is a ceremony using millet seeds for fortune telling and to request a Dragon King and the goddess Yeongdeung both for an abundant catch and safety at sea for the fishermen.